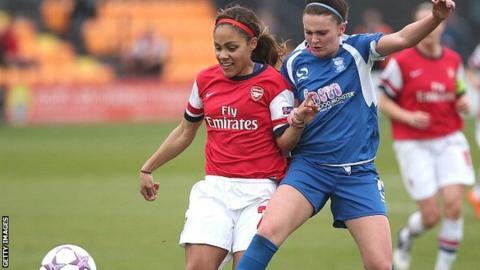 Striker Freda Ayisi scored the winner as holders Arsenal beat hosts Birmingham City 2-1 to reach the semi-finals of the FA Women's Cup. Ayisi's goal followed a Kelly Smith penalty equaliser after the Blues had taken the lead through Remi Allen. Arsenal will face London rivals Chelsea in the semi-finals on 11 May, while Notts County take on Everton. The Gunners lost 3-0 on aggregate to Birmingham in the quarter-finals of the Champions League in March. But they gained revenge with a hard-fought victory against a Blues side who looked lively in the early stages. The hosts took the lead on the half-hour, with Allen heading home a Kirsty Linnett cross after good work by midfielder Jade Moore. Nine minutes later Moore was adjudged, perhaps harshly, to have handled in the penalty area, and Smith struck the spot-kick in off the post. Blues striker Mel Lawley fired a good chance over the bar five minutes into the second half, and the miss proved costly. Four minutes later a Danielle Carter pass set up 19-year-old Ayisi to slide the ball past former Arsenal keeper Rebecca Spencer to secure victory. After avenging their Champions League defeat, Arsenal will have similar motivation when they face Chelsea next week. The west London side knocked the Gunners out in the semi-finals two years ago, before losing to Birmingham in the final.